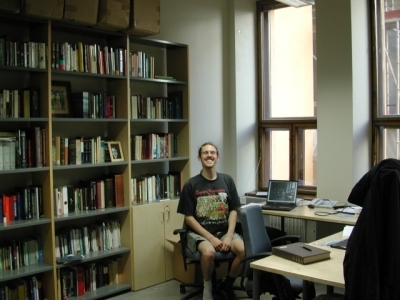 Alaric works at the University of Helsinki, in Finland. This page is just so his friends in Britain can see him in his new habitat. Swedish is another of the university's official languages, and as you can see, it's quite similar to English. Finnish is the third, and it's a bit more different! 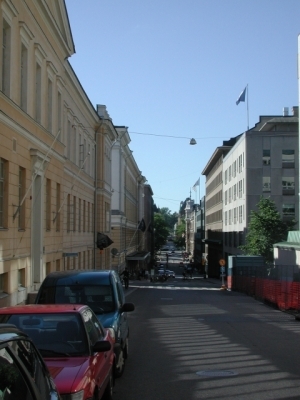 Alaric arbetar vid Helsingfors universitet, i Finland. Den här websidan är bara för att hans vänner kan se honom i hans nya habitat. Svenska är ett annat av universitetets officiella språk, och som man kan se, det är ganska liknande som engelska. Finska är det tredje, och det är inte så liknande! Alaric on töissö Helsingin yliopistossa, Suomessa. Tämä websivu on tehty vain jotta hänen ystävänsä Britanniassa voivat nähdä hänet hänen uudessa elinympäristössään. Ruotsi on toinen yliopiston virallista kielistä, ja kuten voidaan nähdä, se on aika samanlainen kieli kuin englanti. Suomi on kolmas, ja se on vähän erilaisempi! When should I visit Alaric and Beth in Helsinki? 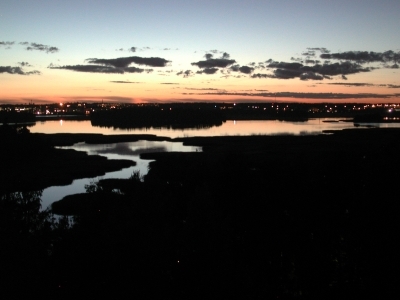 October (lokakuu) sees the leaves turning and some clear skies, which can be brilliant. Not in November (marraskuu)! It's rubbish. December (joulukuu) can also be rubbish, though Tallinn's Christmas market is nice and joulu is cognate with yule. The Finnish for February is helmikuu ('pearl-month') and, like it says on the tin, it's a good time for cold blue skies above and snow below, walking on the sea and cross-country skiing. Later March (maaliskuu) and early April (huhtikuu) is a good time for watching the snow melt around you in the sun, leaving bare trees and dusty streets. It's a weird time to live here but fun to visit, so guests welcome! NB that at Easter everything's shut, but the Via Crucis passion play is wikid. Later April is when the leaves burst and if you get it at the right time it's the most amazing thing ever. Mayday is called Vappu and is a big celebration but kind of a weird time to visit. The midsummer festival is juhannus and obviously there's lots of daylight. The weather is usually warm by now! 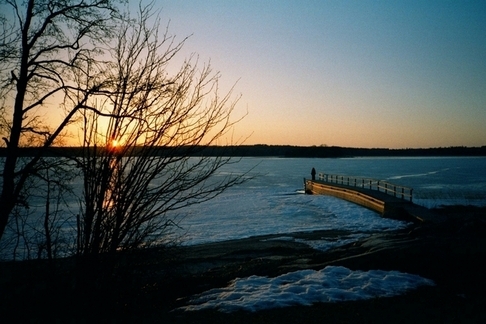 No Finn remains in Helsinki: the best thing to do at this point is to get a cottage by a lake and light a fire. July (heinäkuu) is when everyone leaves Helsinki (except tourists), so it's nice and quiet. The berries are at their best, and although I'm not promising anything, it's sunny and warm. Sometimes 30c (which Glasgow has allegedly yet to reach!). In August (elokuu) the warmth continues, the berries are okay and the mushrooms get going--to peak, I believe, in September (syyskuu). 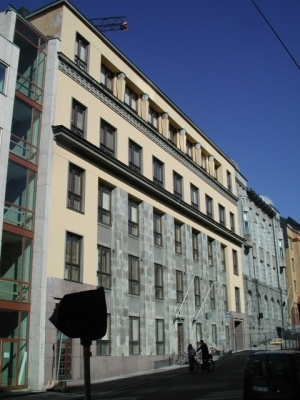 So, there's the building where Alaric works, the Helsinki Collegium for Advanced Studies. If you stand in the street outside the Collegium building and look south, this is what you see. Look, it's sunny, not like in Glasgow! And here's Alaric's office. It has books, and the wireless internet works! But what if you're some lonely international student and you just need a hug? Fortunately, the university provides the HaliCard. A hug or two for the holder of this card. It's good to show this card before a hug. Keep your HaliCard safe. 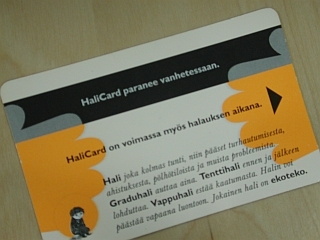 A lost HaliCard can be used by its finder. 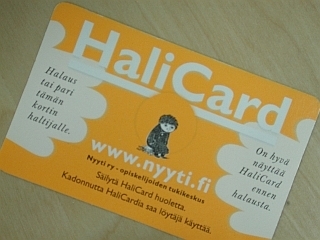 The HaliCard improves with age. The HaliCard is also valid while you are having a hug. A Hug every three hours will save you from frustration, anxiety, stupidities (?) and other problems. A Dissertation-Hug is always helpful. An Exam-Hug before and after will console you. A Spring-Hug will stop you from falling over. A hug can be released into the wild. Every hug is eco-friendly. Outside our home is wikiid! Here's the view from the balcony by daylight. And here's the view by night! Brilliant! How do I get from Britain to Helsinki? These of course aren't your only options, but they show the kinds of possibilities available. Often good to mix and match. You can fly from places like London direct to Helsinki; it's expensive, but at least you save on connecting transport. Ryanair fly between Stansted and Tampere in the evenings. The Ryanair coach from Tampere to Helsinki costs about 30 euros, arriving around midnight. Returning to Britain it's not so good, as you get to Stansted too late to fly out on the same day. You can sail cheaply overnight between Stockholm and Helsinki (Viking Line, 30 euros without cabin for students, beautiful if you have good light/weather), and all day between Tallinn and Helsinki (Linda Line, same price, takes about 90 minutes). Both Stockholm and Tallinn are totally worth going to in their own rights. You can fly cheaply between Stockholm and Prestwick, and London/Manchester and Tallinn, so these can provide useful and groovy non-Ryanair routes. Of course, Helsinki in the sun is not the only thing that Finland is about. 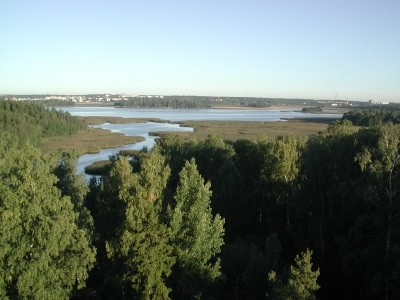 Here's some real habitat, Ekenäs/Tammisaari early in April 2004. I took the picture and everything! 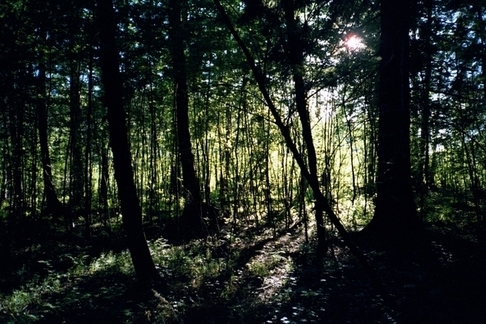 And here's one of Herttoniemi by Beth. We live here!